Rock Creek Park is a peaceful and beautiful refuge within a bustling city. Because of its location in the midst of our nation’s capital, the park has a rich cultural history. It also boasts a rich natural history . With great variation in the landscape, Rock Creek Park has a wide diversity of habitats in which natural communities can flourish. Explore Rock Creek Park’s natural communities! cobblestone-sprinkled dry hilltops dense with oak trees and mountain laurel. No story about any one feature at Rock Creek Park—whether plant or animal, bedrock , shape of the land, stream, or historic/current land use—is complete without understanding something about how each impacts all the others. Let this website help weave together some of these stories and develop your ability to "read the landscape" at Rock Creek Park the way a skilled naturalist can read animal tracks. Explore the website and learn how plants and animals interact with each other and the physical setting to form recognizable natural communities. Learn how humans have influenced those natural communities in the past, and continue to do so today—check out Water & Land Use in the Stewardship and Ecological Threats section. Then... use the interactive map of Rock Creek Park to plan a visit. Armed with your newfound knowledge and skills, hit the trails and explore the natural communities of Rock Creek Park! 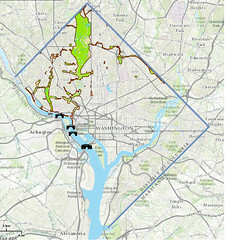 Rock Creek Park administers 2,800 acres in Washington, D.C.In the years that followed, more natural areas were added to the park, including Rock Creek south of the National Zoo, other tributaries of Rock Creek, and other forested parks farther west. Historic and cultural areas, such as the Fort Circle Parks and other sites of Civil War defenses, were also added. Altogether there are now 99 distinct areas (and over 2,800 acres) that Rock Creek Park administers—nearly 7% of the District of Columbia. Even those parcels that bear unique names (such as Glover Archbold Park, Battery Kemble Park, and Dumbarton Oaks Park) are included in the interactive map of Rock Creek Park. Because of its size, Rock Creek Park offers ample space for recreational pursuits (among them picnicking, hiking, biking, jogging, horseback riding, tennis, and golf), while also functioning as a nature oasis for residents and visitors to Washington, D.C.—human AND animal. 1. Bushong W. 1990. Historic resource study. 2. District of Columbia Department of Health. 2004. Final Total Maximum Daily Loads for Metals in Rock Creek. 3. Bushong W. 1990. Historic resource study.